Now that we've read the book and watched the movie, I'm curious what you think. In your comment, tell me at least two differences you noticed between the book and the movie. Then tell which you preferred and why. Please use complete sentences with good punctuation, spelling, and capitalization. My first is that in the book it said that Meg had glasses and braces and in the movie she didn't have either, and then it said there was 3 beasts and there was just two in the movie. Then it said that Calvin had red hair and in the movie he had brown. At the end when the dad (in the book) comes to save her,but we all know that she's alright, does not do that in the movie. in the book Calvin bows to Mrs. Whatsit, and they did not do that in the movie. My favorite was the book because usually the book is better than the movie and this is one of those cases. After when "It" took over Charles Wallice they tessered to the ice planet and the monsters did not have tenticles. And in the book it said Meg had glasses and breces. I like the book better because it is more detailed. Also in the book it did not have the part where "It" died and all that stuff happened. In the book, Calvin and Mrs. Murray had red hair, but in the movie they didn't. Also, Calvin and Meg never went on a walk. Charles Wallace was possessed before they found Mr. Murray, and you never see IT directly. Personally, I like the book a lot better because there is a lot more detail, and the movie is hardly like the book at all. A difference between the book and the movie is that in the book it said that Meg had braces and glasses.Another difference was that in the book it said that Charles Wallace got pulled by the man with the red eyes in the haunted house.In the movie Charles Wallace got pulled in the Central Central Intelligence building I don't know how to spell it but I did the best I could.Also,I liked the book better because in the book you could make up your own story in your mind. I think the book better because there is a lot more detail. 1)They found Mr.Murry before Charles Wallace, 2)IT wasn't lying on a table IT was in a broken pool, and 3)Meg and Calvin never went that special walk. Well there is so much to tell you about but here are a couple. Well Mrs.Whatsit when she changed she had no unlike the book, they found there dad before Charles Wallace was taken over, they never had a feast, Charles Wallace was taken over a different way. I like the book and the movie because you can see what new things they made up but I like the book the best because it just has more details and it sounded cool. It seemed the writer wanted to tell you something important like you are just little you do not know every thing in the world but God does he is the only one. The movie was different from the book by the way Charles Wallace looks. In the book he was blond with blue eyes, but in the movie he was orange haired. I'm still not sure what his eye color was in the movie. Another difference was when Meg was hit by the darkness. in the book she couldn't walk, but in the movie she walked. I personally prefer the book over the movie. I thought that the book was more detailed and the movie left out a lot of things in the book. For instance, in the book it told us that the brain or "IT" was slightly bigger than normal, but in the movie it was colossal. Also, in the book it said that Meg had glasses and in the movie she didn't have glasses. Well, in the book, it said that Calvin had red hair and so did Meg. It also said Meg had braces and glasses. One of the things that really confused me was that Charles Wallace was supposed to fall under the spell BEFORE they found their dad. I would probably prefer the book because the movie was really messed up. I think the book has a lot of details too.That's all I have to say so... see ya! I'm going to tell 2 things that are different from the book. 1. IT wasn't on the table, it was under the pool. 2. Meg and Calvin never went on a walk. I liked the movie better because it had different things like the part when Meg and Charles Wallace went to their house safely and Meg realizes that it was fake. However, the books did not say that they went to the fake imaginary house. Also, Meg found her father too quickly. It was even before Charles Wallace was taken by IT. The two differences are that Mrs. Whatsit was half man half horse in the book. In the movie, she was like a horse with wings and a head in the middle. The second difference was that Meg, Calvin, and Charles Wallace didn't go to the Man with Red Eyes before finding there father. I preferred the book, because the picture in my head looked better then the movies picture. I really liked the book better then the movie. It has a lot more detail .The way of the movie was way different then the way I imagined it during the book. One of the things that were different was that they said Calvin had red hair and freckles. He didn't in the movie! They also said that IT was just a big massive brain sitting on a seat. In the book, Meg and Mr.Murry had glasses but in the movie neither of them had glasses.And in the book IT is a brain but in the move IT is really big.I liked the the book more because it has more details and the move skips a lot of things. The first difference that I noticed was that Charles Wallace became under the spell of IT after Meg, Calvin, and himself had already found Meg and Charles Wallace's father. And that is not what happened in the book. The second difference that I saw was that I don't remember Calvin getting caught and sent into that room where they captured him and then tied him up to that big, metal chair. I don't remember that being in the book either. My personal favorite of the two would have to be the book. It seemed more like the story than the movie. Plus, there were a lot of differences between the two and I wasn't expecting that. Also, because I had read the book before I watched the movie, probably made me like the book a little bit more. Only because I knew the story and I was expecting something totally different than what I had found in the movie. In a Wrinkle in Time it said that Meg and Calvin have red hair but they didn't in the movie. And the Happy-Medium was a girl in the book but in the movie it was a guy. I didn't like the movie very much because it was so different then the picture I had in my head. The book had great details and was much more interesting than the movie. In the book there were three beast and in the movie there were two. Then in the book Meg had glasses and in the movie she did not have glasses.I liked the book better than the movie you got a good image in the book. A few differences I saw between the book and the movie were, in the book The Happy Medium was a girl and in the movie The Happy Medium wasn't a boy nor a girl. I preferred that The Happy Medium was a girl because the three witches were girls. Another reason was Charles Wallace was taken over by IT in the book, when they found Mr. Murry, but in the movie Charles Wallace was still Charles Wallace when they found him. I actually preferred that Charles Wallace was still Charles Wallace when they found Mr. Murry so that Mr. Murry's first, fresh impression of Charles Wallace was real. In the book, It said that Calvin and Meg had red hair. They don't. Also Meg had glasses and braces in the book. She doesn't. And I know a lot of people has said this but he is supposed to get hypnotized THEN find their dad. I LOVED the movie. But the book was a litte better because they left out a LOT of parts. BYE! A Wrinkle In Time is my absolute favorite book I have ever read. One of the differences from the book and the movie was the happy medium. I thought it was supposed to be a girl, but it turned out to be a really weird man. Another difference was that in the movie, when Mrs. Whatsit first came to the Murry's house she never sat in a chair and fell backward. In my opinion, I would prefer the book because it is a great story and the movie is so inaccurate. Even though I didn't watch the movie, I thou have seen the movie before. A couple things I noticed was that IT in the movie where It was colossal instead of it being a slightly oversized brain. Another difference was when Charles fake sent Meg to the house. That never happened in the book, and my favorite would probably be the book and the movie, I liked both. The moive was differnt from the book. I think that the book was better, because the book discribed everything better. Like Aunt Beast had tenticals in the book, but the movie didn't. How the movie was differnt from the book was the father never had a broken leg. 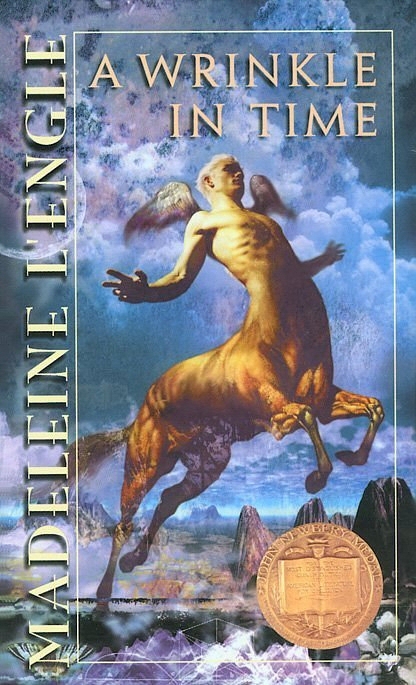 In the book A Wrinkle in Time there were alot of differences between the book and movie like how Meg had glasses in the book and not the movie. Also when in the movie the man with red eyes played a word game with Charles Wacllace and when the father broke his leg. That didn't happen in the book and in the book the Aunt Beast had tenticals but not in the movie. In a wrinkle in time some of the things that were diffrent between the book and movie was that in the book had glasses and braces while in the movie she had neither glasses nor braces. another part near the end was that in the book IT was on a platform and it was described a little larger in then a normal brain but in the movie it was ginormous in size. when you conpare the book was way longer than the movie, however the movie gives you visual image of every thing going on. But when picking I'd go with the book because it was so much more detailed and longer. Peace out my bacon lovers!!! When Mrs.Whatsit came they did not remove her boots in the movie.They found father first not the man with red eyes.I would choose the book because the detailed parts. The book A Wrinkle In Time was very different from the movie. First, the book had a lot more detail than the movie did. Secondly, Meg had braces and glasses. Thirdly, Mrs. Whatsit looked a lot different than the book described her. I enjoyed the book and the movie. But the book was much more detailed. Some differences in the movie were that in the book Meg had glasses. Also in the book Charles Wallece chose to get hypnotised.I would have to say I liked the book more than the movie but can see how hard it really is to make a movie like that so good effort movie makers. I noticed that when Meg and calvin went to the happy median that the Mrs,s called it she,And in the movie Charles got turned in to IT after they rescued his dad. I liked the book and the movie. A couple of differences I noticed were when The Happy Medium showed Calvin's mom but the book didn't, and in the book it said Calvin and Meg kissed, but in the movie they didn't. I liked the book better. One difference between the movie and the book, is that Charles Wallace was changed to IT'S side after they found there dad but in the book he was already changed. Another thing I noticed was that Meg had braces in the book but not in the movie. In my opinion I thing the movie was better than the book.In the book there are some parts were its really confusing but when you see it on the screen its not that hard to understand. In the book Aunt beast had tentacles and in the movie she didn't. In the book Meg and Calvin kissed but in the movie they didn't. I liked the book better because I thought it was more interesting by the way it's organized. In the book Mrs Whatsit called the Happy Medium a him but in the movie Mrs Whatsit called the Happy Medium a she. The other thing is when Mrs Whatsit, Mrs Who, and Mrs Witch gave them there gifts in the book they all got something but in the movie only Meg got a gift. I liked the book way better because it gave a whole lot's of detail. In the movie, there were many different things from the book. One was that the brain wasn't on a table but in a pool. Two is that Calvin dosen't met them in the woods. I like the book better because it has more facts and detail. 1. The brain is 10 times larger in the movie than the book. 2. The beasts didn't have the right features. In my opinion, I recommend the book instead of the movie because, it is more interesting. I think difference #1 is that in the book Aunt Beast has has tentacles, and the book said that the creatures were much bigger that humans(and I certainly didn't expect them to look like Jewbacca.) Difference #2 is that in the book the thing that made the darkness was a brain across the street from Central Central Intelligence. But in the movie it was some big moving-worm-blob thing inside Central Central Intelligence. Finally I believe that I like the book better because when you write a book out of pure imagination all details are correct and you can make it look the way you want it to look, but when you make a movie you always need to cut off some details or change something to make it look better. I liked the book of a wrinkle in time better than the movie because in the movie IT was huge and the book says it was a little oversized. And also in the movie it didn't really explain everything that the book explained really well. There were many diffrances in the movie and the book of, A Wrinkle in Time. One diffrance was, in the book, Aunt Beast cared for Meg for several days, and in the movie she cared for Meg only for a day! The difference between the movie and the book was. The book did not tell about the little worms in the happy median's cave. In the movie Calvin came out while Meg was fighting the boys who made fun of Charles. I liked the book better it had many detailed parts. And I like the book better because it is very specific about what was happening in Camazots. The two differences I noticed were (one) IT was nine times bigger, and (two) in the book Calvin, Meg, and Charles Wallace all got gifts. I like the book better because you get to picture things your way and not the way in the movie. I think the movie was not as good as the book! The difference in the movie and the book is that, the book has more details. Also, Charles Wallce goes into IT, and the 1st monster had tentacles in the book. I think the movie was really good, but not as good as the book! The 1st difference is that in the movie, Calvin didn't have red hair and freckles though he did in the book. It was sort of to obvious to not notice. The 2nd difference is that the tentacle creatures in the book actually had more details. Instead, in the movie, each one looked like Chewbacca! You know, the woolly mammoth from Star Wars. One difference is Charles Wallace went into it before they found their dad. The second is Calvin had red hair ad freckles. I thought the book was better because it had more details. There are many differences between the book and the movie; but I think the book is better for many reasons. One difference is when Meg and Charles Wallace did not go to IT. The other is that the auther said that IT the brain was a little bigger than usuall but in the movie it was huge. I like the book better than the movie. The movie left out details I thought were important. Like, Charles Wallace wasn't possessed when they found Mrs. Murray. The movie wasn't how I imagened the book. I liked the movie better than the book. The reason I say that is the movie gives you a better picture on what is going in the story. The book is realy good to it is also detailed but in the book "The happy meeting" is a girl in the book but in the movie it is a guy. My favorite charter is Calvin because he tried to go get Charles back from It. One of the differences was that Meg had braces and glasses in the book and not in the movie. Another difference is that the beasts had tenticles in the book and not the movie. I would prefer the book because it had more descriptive details. I loved the story of A Wrinkle In Time and thought it was very interesting. I actually liked the movie better than the book because it made me laugh a lot. One difference between the two was that Meg did not have any glasses in the movie like the book. Also IT was bigger than intended. Both A Wrinkle in Time the book and the movie were both, interesting yet very odd. I personally liked the book much more than the movie.There was a huge difference in the movie, it was that Meg didn't have glasses or braces.Witch was crazy because a whole bunch of chapter 1 was about that big detail.Secondly Mr. Murry didn't break his leg nor two ribs. I thought the book was a whole lot better than the movie! I kinda liked the book but I definently liked the movie better because the movie helped me get the book better. Two differences were that aunt beast had tentecals in the book but not the movie. another reason is that meg didnt have glasses in the movie, but in the book she did. and thats my opinion.